Cook with Marco Pierre White and P&O, learn to lindy hop with Saga or trace your family history with Voyages of Discovery; the new range of themed cruises means you’ll never get bored on board! 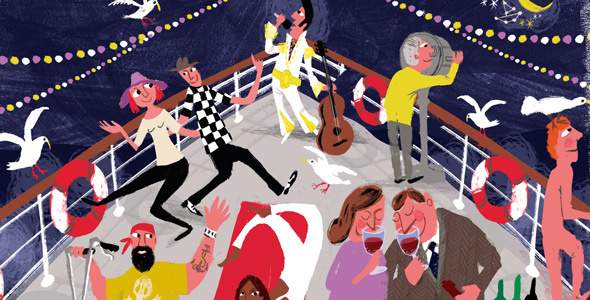 Elvis fans will be in seventh heaven at this cruise and- stay package offered by UK agency Adore Cruises in conjunction with Carnival Cruise Lines. Departing on 5 November, it comprises three nights in Memphis, three nights in New Orleans, and a one-week Caribbean sailing on Carnival Conquest. 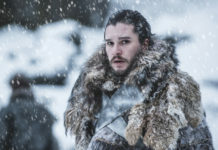 Having run a successful “Sing Live” cruise last year with performances by stars from Channel 5’s Don’t Stop Believing show and professionally-run musical workshops for passengers, Holland America Line is planning another “Sing Live” sailing in 2012, visiting the Mediterranean. Dates to be confirmed. Carnival Cruise Lines keeps the beat going for rock and pop fans with sailings featuring the likes of KISS and New Kids on the Block. It works with US agency Sixthman and one of the most recent sailings featured the Backstreet Boys. Future fixtures include four-night Caribbean sailings including a “Rock Boat XII” voyage on 1 March featuring various bands; a Kid Rock sailing on 26 April; and a cruise featuring American rockers 311 on 10 May. 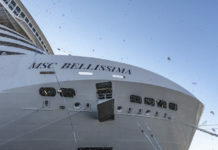 Oceania Cruises aims to get guests into a musical mood with its Spring Music Fest Mediterranean sailing aboard Nautica. The 10-day sailing departing on 14 May, will focus on jazz with guest musicians performing at concerts and casual jam sessions. Plus, there will also be special dance sets with instructors. Join the Diamond Jubilee celebrations of Queen Elizabeth II and marvel at the 1,000-vessel-strong flotilla on the Thames with Voyages of Discovery as part of a 10-night voyage around the British Isles on 26 May. Sail to the spot where the famously “unsinkable” Titanic plunged to the icy depths of the North Atlantic on an eight-night sailing with Titanic Memorial Cruises aboard Azamara Journey to mark the centenary of the tragedy, departing New York on April 10. Follow in the footsteps of the ill-fated Titanic, but stay closer to home on this Cruise & Maritime sailing to France, Ireland and around Britain, departing on April 10. Reach for the stars on this astronomy-themed voyage with Hurtigruten that takes cruisers into the Arctic Circle to admire the night-time light show on a 10-night voyage on March 15. 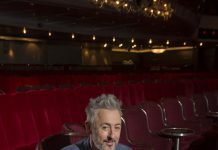 Twinkled-toed passengers can jive, lindy hop and rock their way across the floor on a dance-themed 15-night Baltic sailing with Saga, departing on May 6. Turn up the throttle for a series of motorcyclethemed cruises with Royal Caribbean International ranging from five nights to 11 nights and visiting Bermuda and/or the Caribbean. Passengers can immerse themselves in stamping, scrapbooking and sewing on a special “Craft Cruise” being organised by cruise agency Planet Cruise which has teamed up with TV channel Create and Craft. The four-night sailing to Amsterdam and Hamburg, aboard Cruise & Maritime’s Ocean Countess, departs on 4 May. 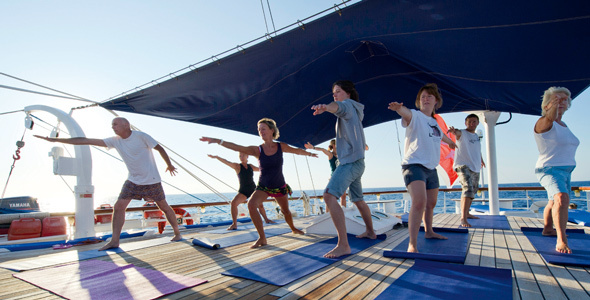 Daily yoga and meditation classes held in the cool of the morning and just before sunset are offered on this sailing with Star Clippers for its 21-night crossing from Barbados to Civitavecchia departing on 7 April. Tuck into the tastes and traditions of continental Europe with Uniworld on a one-week river cruise to Cologne on April 1 that offers beer tasting, chocolate sampling and a food and wine pairing dinner. 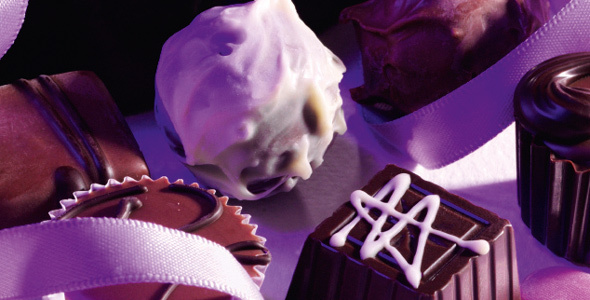 Savour the flavour of a 20-night chocolate themed Caribbean cruise with Thomson Cruises, departing on April 15, when passengers can learn how to make and decorate mouth-watering creations under the eye of a professional chocolatier. 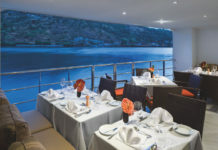 Passengers can perfect their pasta on MSC Cruises’ new food and wine cruises where the Italian cookery schools of La Prova del Cuoco hold sessions on sailings in March, April and May, while the Italian Sommelier Association hosts wine-tastings along with wine and food pairing sessions on two March voyages. For passengers keen to lose weight MSC Cruises has unveiled a special diet-themed sailing with French diet specialist Dr Pierre Dukan, famous for the Dukan Diet Method, on its 11-night Mediterranean sailing on 30 January. Head to the kitchens with celebrity chef Marco Pierre White aboard P&O Cruises’ Ventura for a 14-night Mediterranean sailing, departing on 1 April, when he will host cookery classes, book signings and a Q&A session with the cruise director. Those wanting to go boating in the buff can take advantage of four naturist cruises to Croatia this year (2012). Such was the popularity of two such sailings last summer that the number of departures has been doubled. 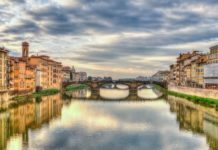 The eight-day voyages, offered by eWaterways, depart in June and August. 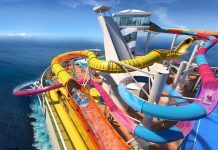 Fresh from hosting what it billed as the “biggest gay cruise in history” on Royal Caribbean International’s Allure of the Seas, US company Atlantis Events is planning a one-week gay cruise to the Caribbean on Celebrity Cruises’ Celebrity Summit on 17 March and a one-week gay cruise to the Baltic on Holland America Line’s Eurodam on 24 July. Strum your way through the Caribbean on a five-day Royal Caribbean International beginner banjo cruise, departing on 8 March, and a six-day intermediate banjo cruise on 12 March. 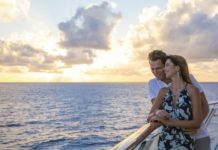 Genealogy experts will help trace your family history on a 17-day genealogy cruise with Voyages of Discovery to India and Arabia, departing on 19 March. Discover more amazing holiday destinations and activities in every issue of Cruise International!